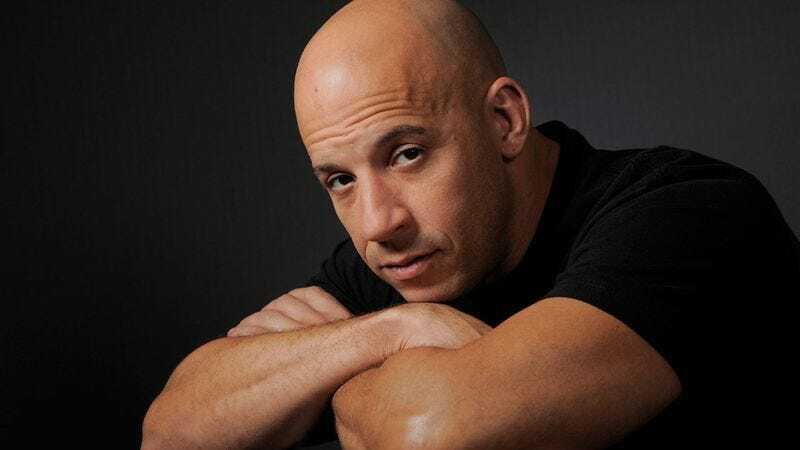 Unleash your imagination and dream up a story to go with these Vin Diesel photos. Your mind can take Vin Diesel on amazing adventures! Obviously, you can pretend this photo is whatever you want, but to us, it looks like a scene from a movie where Vin Diesel is a former Navy SEAL who fought in Afghanistan. After an injury forced him to leave the service, he went to law school and became a federal prosecutor. Now, one of the terrorists he hunted but failed to capture is in Washington, D.C. to get revenge, and only this former soldier can stop him from unleashing a major attack. Remember, these are just suggestions to get your creative juices flowing. If you want to imagine Vin Diesel doing something else, please feel free to do so. That said, this picture really looks like Vin is heading back to his trailer because he wants to check his phone for text messages. When he gets there, he finds a nice gift basket from the studio, and Diesel eats one of the oranges. Maybe Vin Diesel is a gangster known as El Corazón who only hires female assassins. Despite Corazón being a cold-blooded killer, FBI agent James Holstein (played by Liam Hemsworth) must turn to Vin Diesel for help against their mutual foe, who could maybe be a corrupt army general or a serial killer. The movie would be called The Undivided. Sure, this looks like Vin Diesel at a Guardians Of The Galaxy press event. But the power of your imagination can make Vin Diesel do or be anything! To us, Vin Diesel is a mad scientist who turned his dog into a talking plant monster. 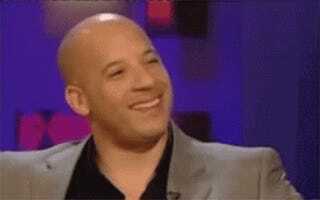 In reality, this is a shot of Vin Diesel laughing from a talk show. But in our minds, Vin Diesel is laughing because a small man is hiding under his chair and tickling the back of his knee. Sometimes we like to pretend that we’re Vin Diesel. That his big, strong body is our body, that when we speak it’s in his gravelly voice. Vin Diesel is going back in time to kill Hitler, and we choke Hitler to death with our big, strong hands. Imagination is fun! #whatcanyouimagine?